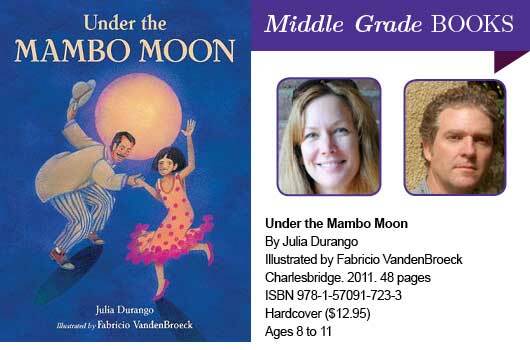 Under the Mambo Moon is really two books in one. One book tells a story in words and magnificent black and white illustrations: It’s the story of a young girl named Marisol, who helps her dad at his music store. All day long, people enter the store looking for a special song. Her dad has told her that one can learn a lot about a person by the type of music he or she listens to. As the day continues, Marisol learns not only about her community, but also about the different types of music available to her. At the end of the story, readers are rewarded with a color image showing Marisol and her family as she dances into the night. The second book is about the dances themselves. After each person in the store has selected a particular type of music, the following two pages provide a color illustration of people doing the dance along with a one-page narrative. The use of color helps to make the dances come alive for readers. Young readers can choose to learn about all or just some of the dances mentioned in this portion of the book. A four-page author’s note with more information about each of the dances mentioned in the story and a map are also included at the end. Highly recommended for teachers and librarians and for those who simply love to dance!